The Center for Communal Photosynthesissm Research, Inc.
Is Education the Only Purpose Institutions of Higher Education Have? Institutions of higher education have traditionally remained uninvolved in the democratic governance of the American civic society. Teaching students is not the sole purpose of these institutions. Author Emmanuel N.A. Tetteh contends institutions of higher education have a responsibility to contribute to developing a well-mannered society. 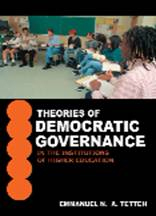 In Theories of Democratic Governance in the Institutions of Higher Education, Professor Tetteh addresses the concern that institutions of higher education are not living up to their responsibility to developing a well-mannered society causing a decline in the security of society. Is there any moral obligation for the institutions of higher education to direct their civic missions toward developing a well-mannered society or democratic governance? In what ways can higher education live up to its civic missions? Tetteh posits that “the ideology of the development of civic virtues for higher culture in the democratic governance of civic society, exemplifies one of the social fabrics of good citizenship for ensuring homeland security at the face of growing regional or tribal conflicts, civic unrests, and the terror threats of radical religious fanatics in the world community.” As concerns of terrorism continue to rise, Theories of Democratic Governance in the Institutions of Higher Education looks at the role that institutions of higher education should have in contributing to society’s social conduct to ensure homeland security by redirecting their academic programs. ISBN: 0-595-31465-1 -- Paperback 6.0 x 9.0 -- 108 pages -- Price: $12.95 U.S.
ISBN: 0-595-76890-3 -- Hardcover 6.0 x 9.0 -- 108 pages -- Price: $22.95 U.S.
To browse the preliminary pages of the book: Theories of Democratic Governance in the Institutions of Higher Education , which consists of the title pages, the copyright information, publishers information, dedication, acknowledgement, TOC, list of tables and figures, preface, and introduction please Click Here and click on the white arrows in order to navigate through the pages. Provides individuals a simple, fast and affordable way to publish, market, and sell fiction and non-fiction books. The company is one of the largest book publishing companies in the United States. iUniverse eliminates the necessity of massive print runs, dramatically shortens time-to-market, and gives authors control over when and how their works are published. iUniverse publishing programs are endorsed by industry leading author organizations, including the Authors Guild, ASJA, and Mystery Writers of America. iUniverse is a proud member of the Association of American Publishers, Publishers Marketing Association, and Small Publishers Association of North America. The company's major investors include Warburg Pincus and Barnes & Noble.